Holiday season is getting closer and closer each day...the presents are packed, all the necessary preparations are made. You are entering the store hoping to buy a greeting card for your friends, sweetheart, loved ones, colleagues and acquaintances... But all what you keep coming across are cards with the same routine approach: banal images and hackneyed phrases. Sounds familiar? Well, I'm sure it is. Even though the modern light industry evolves excessively fast, pleasing our eyes with all sorts of cards stuffed with glossy images and pompous words, mainly it is aimed at an average consumer, and does not take into consideration likes and dislikes of a particular person. So why not to make a personalized greeting card that expresses who you are and has Your message for special people in your life. You can make your card fit a specific theme by making it funny, serious, elegant, nostalgic or whatever your heart desires. 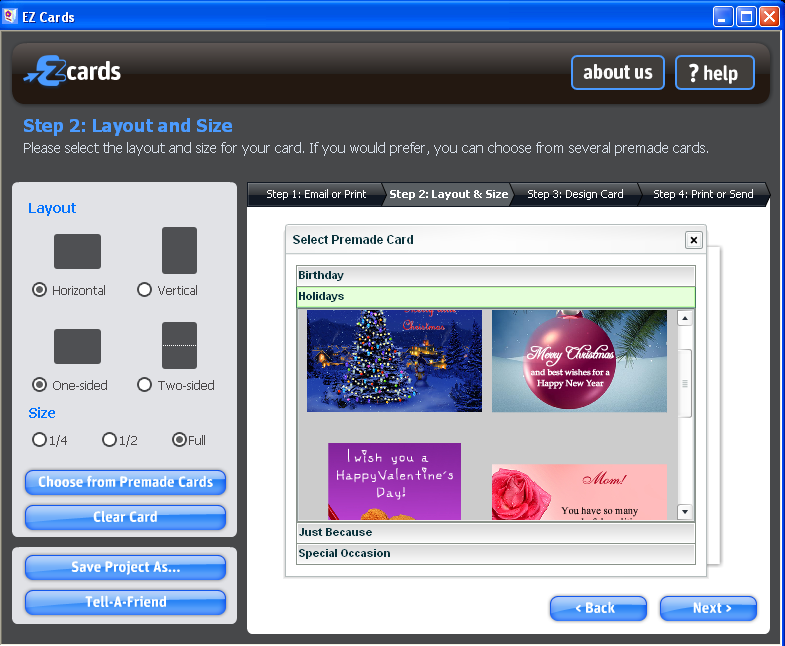 The program EZ cards will help you to create stunning greeting cards just by following four easy steps. First, you'll be asked to select the card's destination (print or e-mail). E-mail option will let you type in your friend’s email address and send your completed card directly to them. It's an extremely useful option in case the recipient is in unreachable in person and you can't give him or her the printed version of your piece of art. The next step is to select the layout. The layout can be horizontal or vertical, it can have one or two sides. 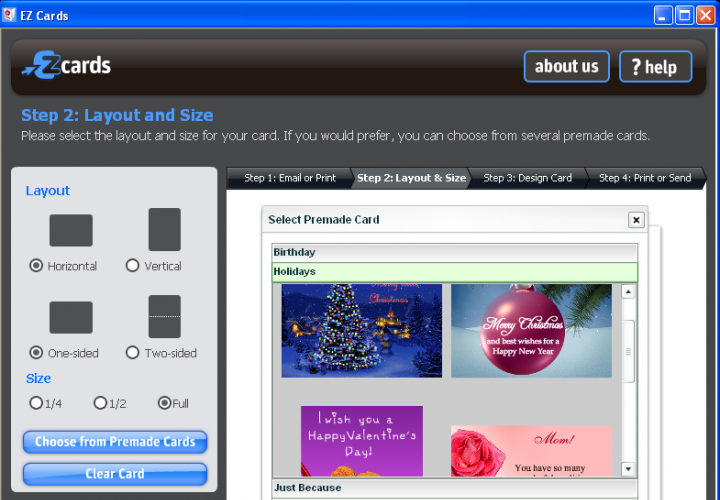 Please note, that cards that you want to e-mail will have fewer layout options, particularly, only the ability to choose a one-sided card, which does not include front or back. The third step is only limited by your imagination. Despite the fact that this program is free it offers a generous number of variations for all types of holidays, special occasions and significant dates, starting with Halloween ending with the baby shower. 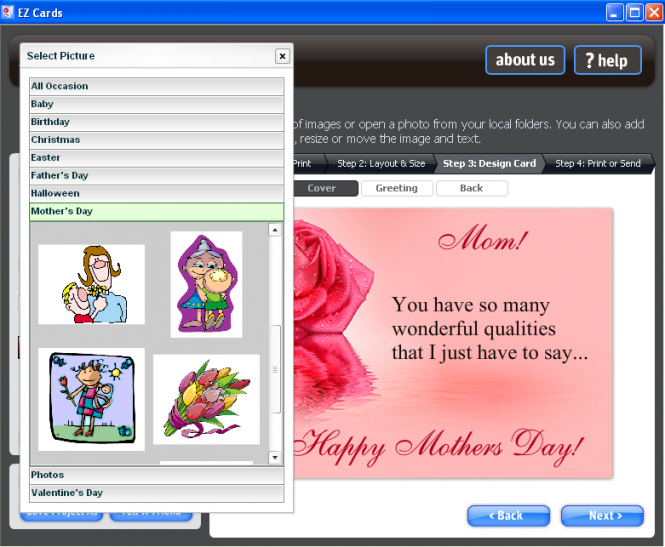 You are free to choose images, numerous clip arts, personalized text boxes and even include personal elements such as photos. 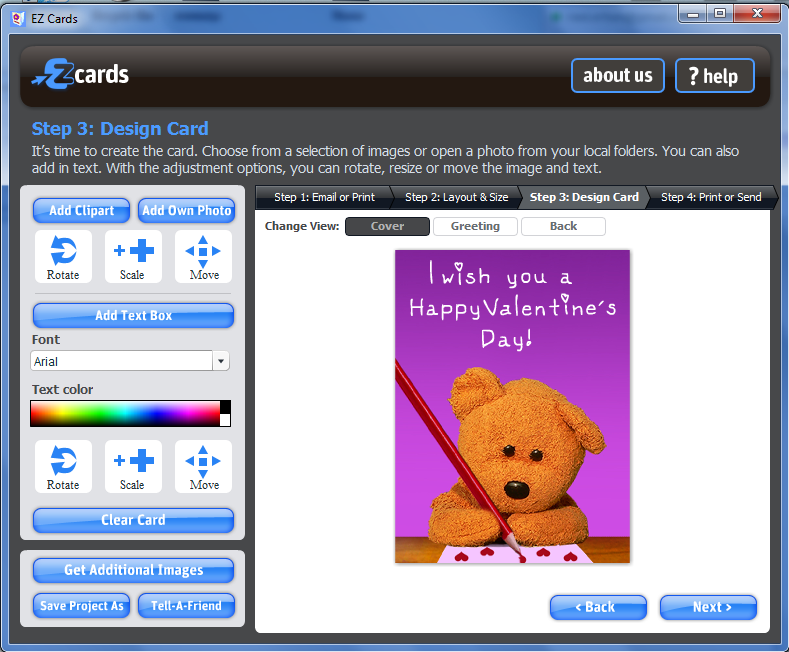 Using the adjustment tools, you can rotate the image or a text box left or right, resize the image and move it around the card. Also you can edit the font style, size and its color. 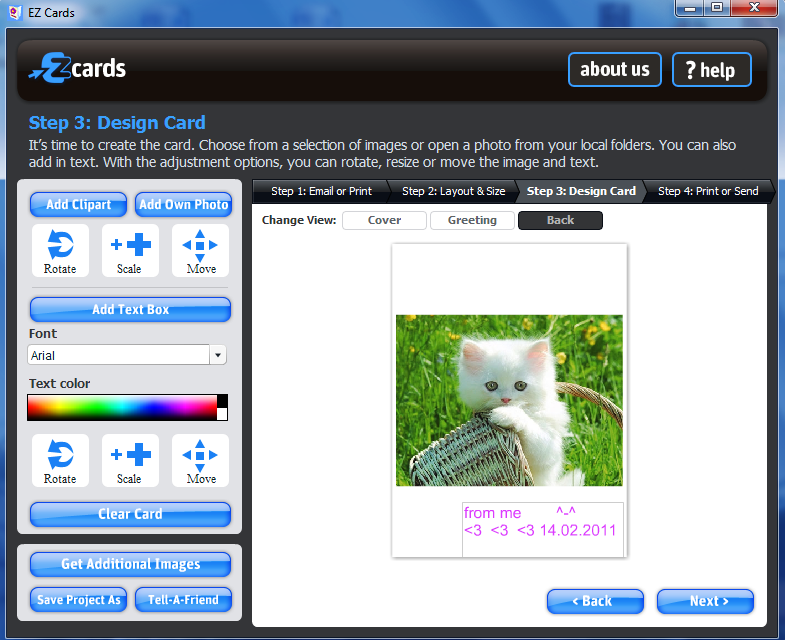 Additionally this incredible cards creator incorporates the option to use premade cards in case you want to do it the quickest way possible. 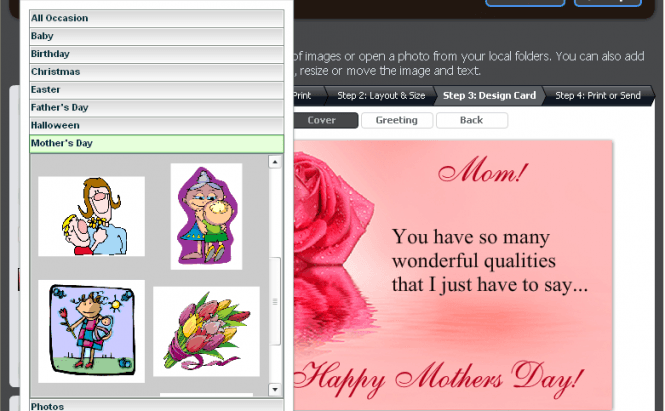 And don't worry, using a template isn't cheating, especially because you always have the option to personalize by adding additional text or clipart to your card. In the long run you will have to choose between sending or printing the card. 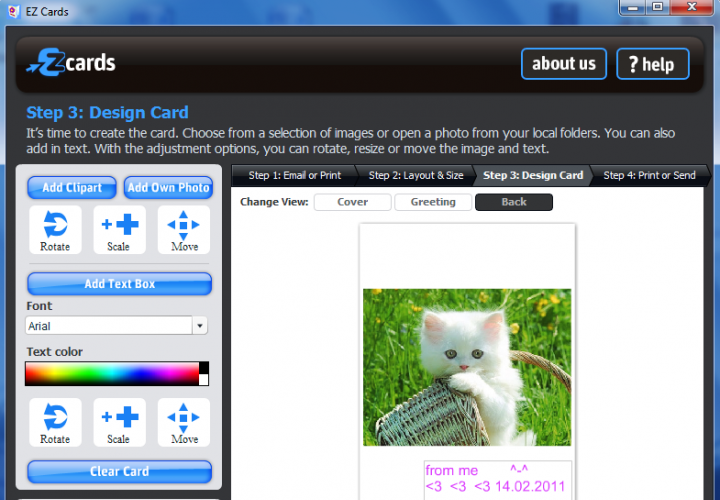 To send your card you have to enter recipient's name and e-mail, as well as, your name and return address. 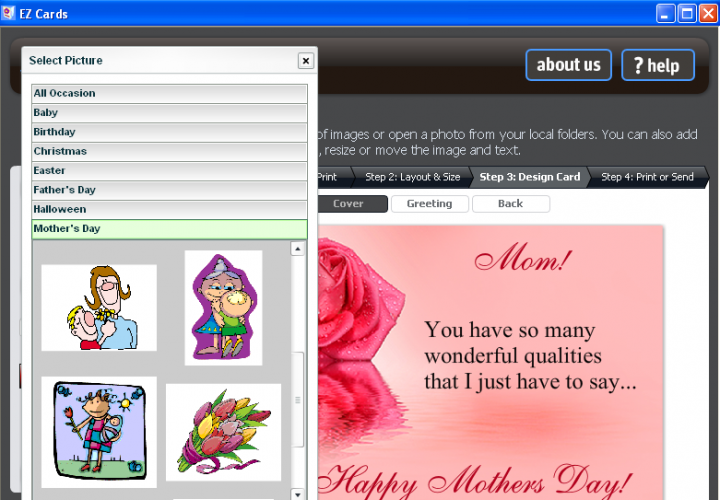 Moreover, you also have an option to save your card as a .jpeg format file for your alternative sending ways. Admittedly, there are many reasons to choose self-made greeting cards over those you buy at a store including cost and personalization. 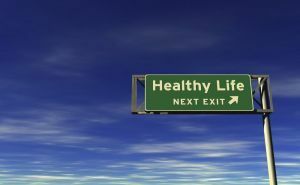 Using the program EZ cards you can optimize these criteria at most. 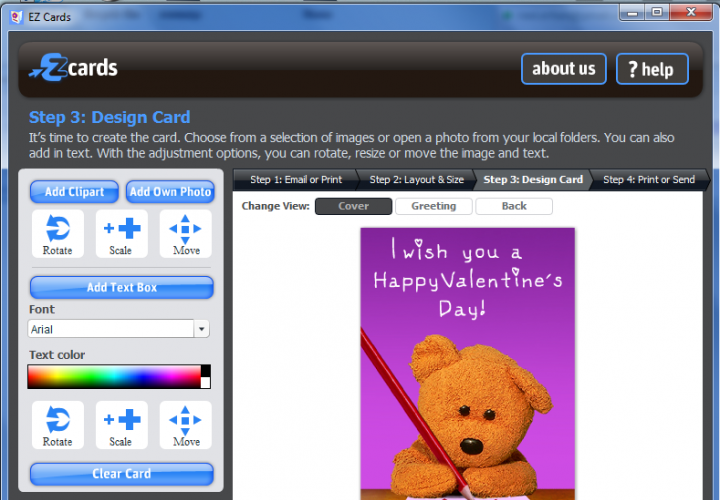 As a result, you will create a card that will be extremely meaningful to the recipient and just as appealing as any greeting card bought at a store!